The Fiesta Disk Water Pitcher comfortably holds eight cups of water (9 is a squeeze). It stands approximately 7 1/4" high and 9" wide. 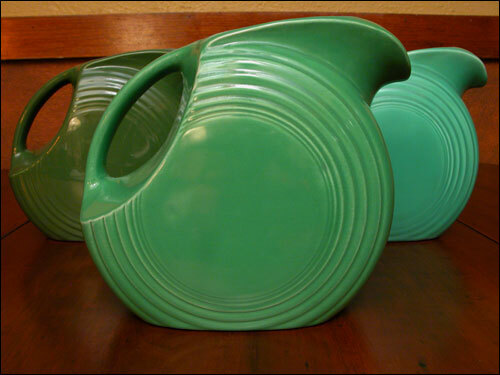 Homer Laughlin is still making water pitchers with the very same molds designed by Frederic Rhead in the 1930s so you must know the colors, the marks, and the difference between the two bodies. The flatness of the top inside back is a simple and fool proof way to seperate the old from the new. (The flatness of the joined handle on the inside of the pot, as shown in the fourth picture above, is noticably different than the indented hole found currently). HOW TO TELL THE OLD FROM THE NEW? 1. If there is a raised letter "H" on the bottom it is new, but the absence of the raised H doesn't mean it is positively pre-1986. HLCo added the raised H after reintroduction when grey came out and was so similar to the vintage grey. So your water pitcher could be from 1986 and not have a raised H on the bottom. 4. Color- Know Your Colors. The vintage glazes were much different than those being used today. The old colors are much more opaque and become dense and solid, but the new glazes have a transluceny to them that thins them out over edges and across ridges. This is readily apparent in the new cobalt and persimmon (which can be mistaken for vintage red). The Dancing Lady logo, FIESTA, the FIESTA script logo, HLC, THE HOMER LAUGHLIN CHINA COMPANY and the Fleur D' Lis logo are registered trademarks of The Homer Laughlin China Company. The HLC logo and HOMER LAUGHLIN are company trademarks. HappyHeidi.com is not affiliated with, endorsed or sponsored by the Homer Laughlin China Company.